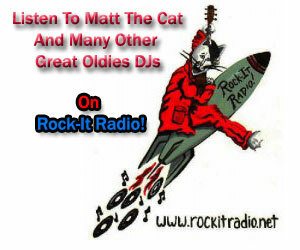 Friday Night Cat Fight » Blog Archive » 5/6/2011 – The “Good Rockin’ Tonight” Cat Fight! Thanks so much, Matt! Elvis for me, ALWAYS! Cool for your sake too, that you could include R&B in the… uh…Saturday night cat fight. Great! Had to go with the version by The King, but Wynonie’s version was very cool. Love the pumping piano in his version. Welcome home Matt. I hope Voice of America knows how lucky they are to have you. My vote tonight goes to Wynonie “Mr. Blues” Harris he certainly made the song HIS. Thank you again for all the time you devote to us “your fans”. P.S. Glad “ The Juke” is back also. Impossible! How on earth can I pick between Wynonie and Elvis? Wynonie wears the song like a pair of loose shoes and Elvis’ take is dynamic and shows his vocals at their best. The nod goes to Wynonie. I liked Elvis’s rendition. Wanda Jackson did a respectable one too. I enjoy the history and the back stories. Keep it up Mat. Since you first aired “The Big Bang”, I’ve always felt that Wynonie’s version was the “first” real rock and roll record and I voted for that one. The other two are also great and Elvis is really at his best on his version of the song. Hope you had a great time in Scotland, Matt. Thanks again for everything and keep up the good work as always. Mr. Blues gets my vote but I agree this is one of the most significant songs in the history of modern music. Love Harris’ version but the nod has to go to Elvis here. For me, forever, Elvis at Sun in 1954 shouting “Weeeeeell…” the true rock´n´roll revolution! Wynonie Harris’ voice has just the right amount of grit for this song. For me, the nod goes to him. Have to vote for Wynonie Harris on this one. Although Roy Brown wrote and recorded it first, Wynonie took it to another level. And Elvis’ version is a very, very good version and it was the first I heard of this song, but I think the originators of the music should be recognized!! I agree wholeheartedly with the other comments on here about how lucky we are to have the “furry leader” providing the great music and the back story on the songs and artists. Keep up the good work, Matt. Hope the day gig doesn’t interfere too much with FNCF and JITB!! Elvis will always be the best, pure rockn’ roll. I prefer Elvis’s version because it’s pure rock’n’ roll and more feelings. WH by a pretty substantial margin, although all three versions were great. RB’s has such a strong swing influence that it had to be impossible to see what WB was going to do with it. Aside from the fact that it’s a superior arrangement to the others, its historical significance can’t be discounted. Elvis? Elvis? How can anybody vote for Elvis, he missed the “hoy” “hoy”s and well it just doesn’t go anywhere. On the other hand we were split between Roy Brown (my vote) and Wynonie Harris (Deb’s vote). I thought Roy’s vocals were great, sliding all over the place and Deb thought that Wynonie had a more rocking version. O.K. Well Bella the dog did vote for Elvis, but that’s only because he recorded Hound Dog. Thanks Matt, great Cat Fight and appreciate your commitment to getting these out now that you have a full time job.